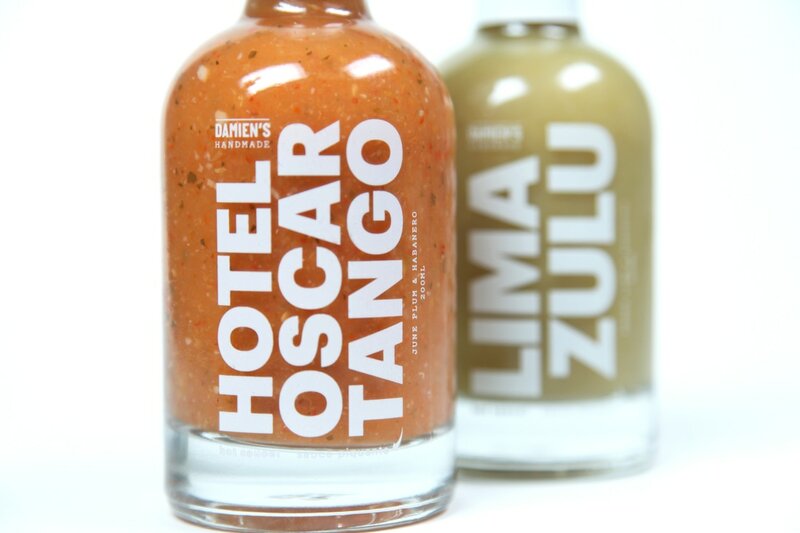 The HOTEL OSCAR TANGO is a true "goes everywhere" habanero hot sauce made from only fresh ingredients - no salt or sugar added. With a lovely depth courtesy of garlic and fresh herbs, it is the epitome of delicious-hot. The LIMA ZULU (aka THE LIME ZINGER) is the milder, lime-based cousin of the red sauce. With 2-3 fresh squeezed limes in every bottle, it tastes incredibly bright and zesty - unlike any hot sauce you've ever tried. Damien grew up on a farm in Trinidad where food was the center of life in every respect. There was no such thing as a non-fresh ingredient, and no such thing as a bland meal. Fortunately for everyone who knows him, he moved to the Toronto area as a teenager. Both sauces are influenced by their Caribbean roots, but have been taken to another level by their creator. The sauces are simple yet complex, and mellow nicely with age. Just like Damien. With that, a near-epic alliance was forged between the sauce master and a doer of other stuff & things. A little over a year later, in August of 2014, the first bottles were sold to Sanagan's Meat Locker in Kensington Market. As of the summer of 2017, Damien's Sauces are available in over 100 stores across Ontario, Quebec, and Manitoba. Hotel Oscar Tango is a registered trademark of Damien's Sauces Ltd.